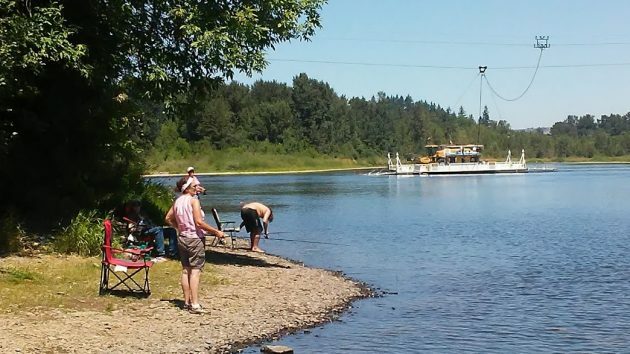 Anglers pay no attention as a combine crosses the Willamette on the Buena Vista Ferry Tuesday. If you wonder whether the Buena Vista Ferry is a necessity and not just a tourist attraction, the picture should clear that up. Without the ferry, farmers with operations on both sides of the Willamette would face a difficult situation, especially during the grass-seed harvest. They would have to make detours to the bridges at Albany or Independence in order to work their fields. As it is, operators can drive their combines on to the ferry and reach their destinations in a matter of minutes. A ferry has been operating at Buena Vista since 1852, and the Marion County Public Works Department continues the service today. In 2011 it launched a new boat with a six-vehicle capacity, replacing one that could carry four vehicles and had been in service for 55 years. To pay for its two ferries — the other is at Wheatland and serves about eight times as much traffic as Buena Vista — Marion County uses state gas tax receipts, federal funds and toll revenue at $3 per vehicle. At Buena Vista, the county expects to collect about $70,000 in tolls this fiscal year, up from $54,474 in 2016-17, the last year for which actual numbers are available. For a car, the ferry charges $3. On a bike you pay $1, and on foot you can cross for free. The toll goes up for bigger vehicles, up to $18 for a rig using the entire boat. Operating both ferries costs the county a budgeted $2.2 million in fiscal 2018-19, up from $1.8 million last year. Among other expenses at Buena Vista this year, the county lists $280,000 for 19 wireless message signs telling motorists about current operations, and $187,000 to design and construct an extension of the east ramp. A bridge would be nice, but too many of our current bridges are in dire need of repair. Are you sure it’s Marion as I believe it is run by Polk County? The Buena Vista Ferry is a gem. It has been operating since the year my relatives on my mother’s side arrived in Oregon by wagon train…that is, 1852. I miss the old ferry. The best thing about this story is that it shows that real americans are ready to help each other even if they don’t benefit directly. Most folks in Marion County will never use the ferry. Yet they support it. It’s about being a real American. All we ask is that you believe in Truth, Justice and the American Way. What is a priority to local government? A priority is something that is more important than other things and needs to be done first. Given finite resources, every organization must go through the process. And deciding what needs to be done first requires prioritizing priorities. Essential services like police and fire come to mind. Clearly these tend to rise to the top of any local government budget. Some would argue public transportation should be up there too. Now the question becomes: Given a finite pot of money, is spending $2,200,000 on a system that benefits so few a priority? This is a legitimate question and should be on the lips of every taxpayer. Well, the ferry is certainly useful to the folks in the area, rather than travelling up to Independence or down to Albany to cross the river, especially with slow going farm equipment. I guess the alternative would be to build a bridge. My best guess as to the cost of a new bridge is the replacement of the Van Buren bridge in Corvallis, which ODOT has estimated at $61.9 million. Based on that estimate, the ferry is an economic choice for the next 28 years at $2.2M/year. That’s not taking into account the changes that would have to be made to the roads at either end of the river, which are cattywampus to each other right now, whereas the roads in Corvallis are already set up to accommodate the existing bridge. That also excludes any ongoing maintenance to the bridge as well as all the environmental, archaeological, historical, naval and medical studies that would need to be done to allow it to be built.